Hello everyone and welcome. Rebecca here and I'm back to host the second week of the challenge at Frilly and Funkie. I love this time of year and really enjoy dressing my home for Thanksgiving. For those of you who don't celebrate this American holiday, just think about gratitude and how you can express it. 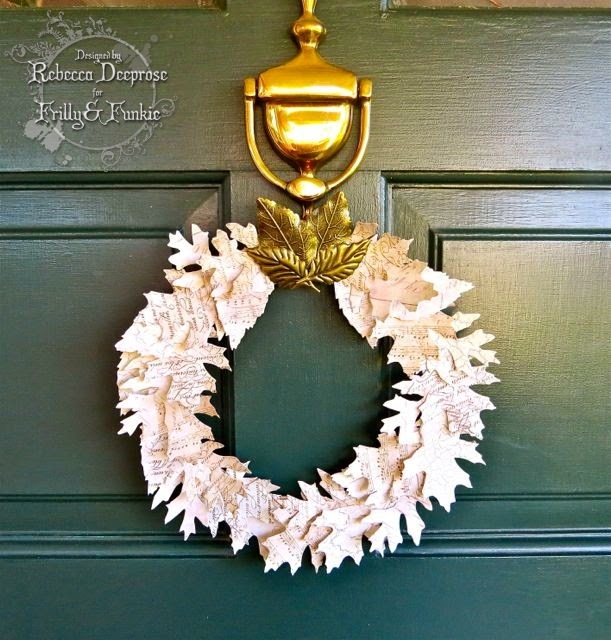 Create an invitation, table decor, decoration for a door or home decor item with gratitude or the Thanksgiving theme in mind! With all that inspiration to get you thinking it's now your turn to share your Thanksgiving and gratitude projects using the link below. We look forward to seeing what you come up with. Welcome to the Frilly and Funkie challenge blog for the start of a new week, and it's time to announce the winners of the 'Autumn Colours' challenge. Thank you so much to everyone who took the time to enter with some fantastic projects. Sadly we had to discount a number of entries as they had exceeded our 'enter up to 10 challenges including ours' rule, which was so frustrating! However, we were still left with some difficult choices to make from those who followed the rules and the Design Team finally settled on a gorgeous card by #15 Lynn Price of 'Experiments in Paper'. 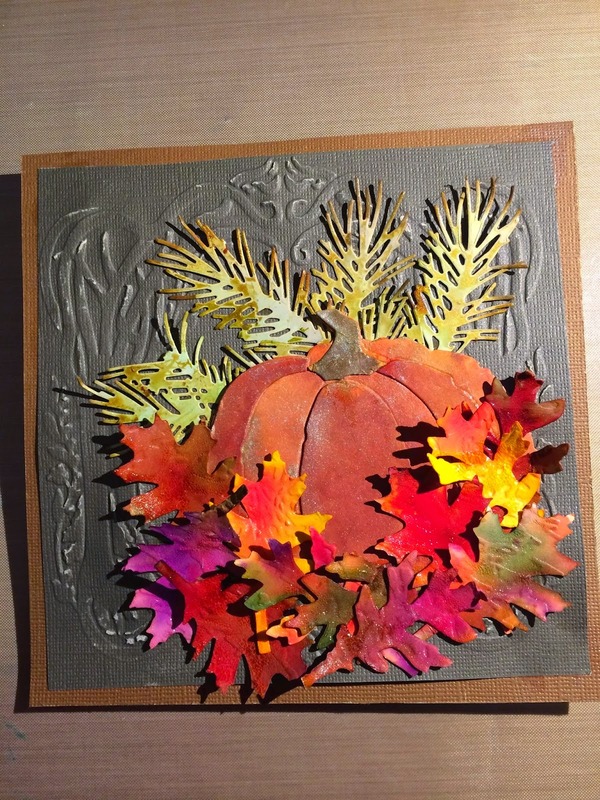 Lynn really captured those vibrant Autumnal Colours perfectly here and we were even more impressed when discovering that this was her first ever challenge entry! Congratulations Lynn on being our favourite for the 'Autumn Colours' challenge and winning the opportunity to be a Guest Designer here at Frilly and Funkie for a future challenge. And Random.org has chosen a winner for our $25 gift certificate to The Funkie Junkie Boutique. Our congratulations this time go to #10 Art with Yogi. A huge thanks from the Frilly and Funkie team to everyone who took part in this challenge and congratulations again to our winners. Please email Linda at thefunkiejunkie@gmail.com for the codes for the winner's badge and to give us your email address for the Guest Designer details (Lynn) and for the gift certificate details (Yogi). Our current challenge, 'A Grateful Welcome', runs through Tuesday, November 4th. We hope to see you entering this time around so that you too can be in with a chance to win. And remember, you can enter up to 10 challenges including ours, and a maximum of 3 entries per person to our challenge. Please remember to link back to our challenge in your entry and mention in your post that you are entering this Frilly and Funkie challenge. And now for some exciting news... we have a new Design Team member!!! Please join with the whole DT in welcoming the wonderful Nicole Wright of 'Canadian Nickel Scrap'n' to the Frilly and Funkie family. We can't wait to share the results of Nicole's creativity with you over the coming weeks and feel sure she'll be a great addition to the team. I would like to say a huge thank you to Linda for allowing me the honour of being part of such an amazing team; it is an amazing team and one I was thrilled to be part of. Huge thanks too to Jenny who works so hard to lead us all and help us out. And finally huge thanks to all my lovely team mates. I started by covering a piece of mdf board with some paper in a reddy orange. I then applied some of Wendy Vecchi's yummy Embossing Crackle Paste in various thicknesses across the piece and left to dry. Here is a close up as it starts to dry and crackle. I then added some Distress Stain and dried to add colour to the paste. I loved how it coloured up the crackle. Now I spritzed with the new Tarnished Brass Distress Stains Spray from a fair distance to get this lovely splatters of colour and metallic shimmer. Now I used one of Wendy Vecchi's stencils and applied some Walnut Stain Distress Ink to add some soft flourish detail. I love building up all the layers in this way. Here is the background so far, with that stencilled detail. Now for some coloured paste, I added some of the Stain and some of Wendy Vecchi White Embossing Paste and mixed them together. Now I applied some Tissue Tape; any tape will do to hold the stencil, but mainly to mask off the area next to where I was applying the paste as I only wanted a small part of the stencil. I then applied my coloured paste and repeated this in the other corner of the background too. Now for the heart; I drew around the heart from Wendy's stencil, cut it out three times and layered these up to give a bit of thickness. This was then coated with Glue n Seal before I applied a generous layer of Crackle Paste. The flowers were die cut using Tattered Florals die, spritzed with water, scrunched up and left to dry to give all those crinkles. They were then sprayed with the new Distress Stain Spray on both sides and then with water before being dried. I added some more colour with Distress Ink and Stain so they didn't look too flat. The leaves had been cut, spritzed with water, scrunched up and left overnight to dry. I then spritzed the leaves with water and swiped over surfaces with various Distress Stains, spritzing them and drying to get a lovely blended colour. I continued to spritz them with Distress Stain Spray and water to get the right look. To add another colour and tone down some of the orange I also added some Crushed Olive Stain, applied with kitchen towel to main background surface. Here are the flower layers after spritzing with lots of water to remove the bright orange and adding in some other colours before layering up. I added a row of stamping to the top and bottom of the board using Jet Black Archival Ink. I love how all the colours and that shimmer from the Distress Stain Sprays work together. And the crackled heart all coloured up with Stains rubbed in with a baby wipe before a focal sentiment is added. Hope you've enjoyed my tutorial and maybe even give it a go yourselves sometime.